The second book in the Beirut Trilogy, Bride of a Bygone War is set in the spring of 1982, when Lebanon hopes for fresh political winds that might end its seven-year civil war. Enter Walter Lukash, a midlevel CIA officer assigned as intelligence liaison to the Phalange militia. Lukash soon becomes a pawn in a Levantine game intended to draw the U.S. into conflict with Lebanon’s Syrian occupiers. Unfortunately, Lukash is too distracted by problems arising from having abandoned his Lebanese bride five years earlier to see the trap until it springs. Beirut, 1982. Walter Lukash, a journeyman CIA case officer, has been posted in the Middle East for eight straight years and is ready for a quiet desk job back in Washington. When he is ordered to Beirut instead for a two-month secret liaison assignment with the Phalange militia’s intelligence unit, his superiors believe they understand his reluctance to accept. What they don’t know is that, five years earlier, Lukash secretly married a Lebanese woman against Agency rules and abandoned her soon after the outbreak of war. More than that, his new Irish live-in girlfriend, whom the Agency considers a security risk, has followed him to Beirut from Amman and Lukash has defied orders to break off the relationship. When the two-month assignment is extended to two years, Lukash realizes he can no longer avoid painful realities and choices. But before he can straighten things out, he is caught in a deadly three-way intrigue between the Phalange, the U.S. government and Lebanon's ruthless Syrian occupiers that threatens to unleash the full force of Syrian-backed terrorism against Americans in Beirut. 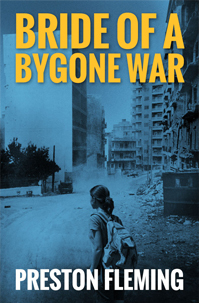 Bride of a Bygone War captures the unique atmosphere of Civil War Beirut with a lively and intelligent style that draws the reader into deep identification with the characters and the action.